GREECE: Get insured or hand over the license plates? Comments Off on GREECE: Get insured or hand over the license plates? Starting 14th April drivers will have to choose whether they will buy an MTPL insurance policy or give up their vehicles registration plates. The dilemma in this particular situation stems from a modification to the law made by the Finance Ministry, which concerns vehicles that run without an insurance policy. This raises the question if it is cheaper to have motor third party liability insurance or pay the big fat fine. The Ministry is talking about 1.7 million uninsured vehicles that run in the entire country. In order to identify them, the database of the Insurance Guarantee fund and that of the Ministry of Transportation will be crosschecked, this way comparing the records of all insured vehicles with those of all registration licenses. The average price for an MTPL insurance in Greece is of around EUR 250. Together with the implemented yearly taxes, this can add up to substantial expenses for the citizens who usually prefer to avoid paying the extra cost of the compulsory insurance policy. Therefore, starting 14th April the Ministry will send a 10-day notice to the owners to insure their vehicles or hand over their registration plates. If not, all data about those uninsured will be sent to the police and there will be issued a fine that can reach, depending on the vehicle, EUR 1000. The value of the fine will go up until when the fine is paid and the vehicle has a valid insurance policy. Furthermore, the driver’s license and registration plates of the vehicle will be removed and held up for 10 days until the resolution of the problem. In case of an accident the owner will lose the vehicles registration along with the registration plates for two years and in case of the driver being under the alcohol influence the penalty will be for three years. 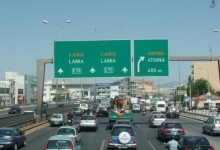 These changes to the law for the compulsory MTPL insurance were made in order to put a stop to this phenomenon that raises the danger of unresolved traffic accidents in the road network of Greece.